Carrie Underwood made her first public appearance since suffering an accident at home in November that left her with a broken wrist and 40 to 50 stitches in her face — and on the basis of the performance as well as the photo she posted on Instagram yesterday, we’d never have known she’d been injured. She delivered a powerful performance of “Cry Pretty,” the first single from her forthcoming album, her first for Universal Nashville, which does not yet have a title or a release date. Wearing sparkles around her eyes in the shape of tears, as she does in the visuals for the single, traces of any injury were not detectable on television. Reactions on social media after her performance ranged from enthusiasm to relief to confusion to cynicism. The song is a sweeping power ballad that at times is more reminiscent of Guns N’ Roses’s “November Rain” than much of her previous work. In the post, she writes of working with writer/producer David Garcia — who’s worked both with Christian country artists as well as Florida Georgia Line — and said he’s co-producing her forthcoming album with her. 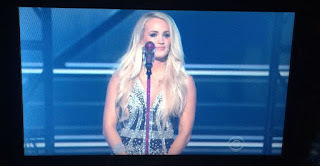 0 Response to "Carrie Underwood Makes First Public Appearance Since ‘Gruesome’ Facial Injury on ACM Awards"